Today I finished reading Sons and Lovers for the Outmoded Authors Challenge (post to follow) and haven’t started another book yet. I thought I’d take stock and see which books have been hanging around, lurking in different piles waiting to be read. 1. Lewis Carroll by Morton Cohen. This is a long and detailed biography and I read some each morning, so it’s taking me quite a while to finish. I’m just over half way into the book. 2. Remainder by Tom McCarthy – a novel about a man who is suffering from amnesia and trying to re-discover his identity. I started this in August and at first I was enjoying it. But then I found it hard going, as it seemed to be going over and over the same ground. Whilst this does reflect the state of mind of the main character as he tries to regain his memory it became tedious. It’s a disturbing book, strangely unreal. On the back cover the book is described as a ‘darkly comic meditation’. Well, it’s dark but I don’t think it’s funny. I’ve only got about 90 pages left to read, so I suppose I’ll pick it up again sometime. I don’t think it will matter if I can’t quite remember what happened in the first 196 pages, as it’ll probably be repeated before the end. 3. Tales of Mystery and Imagination by Edgar Allen Poe. I’ve read quite a number of these and will carry on until the 31 October at least – that’s when the R.I.P.II Challenge finishes. 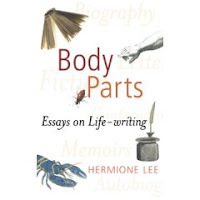 I’m still dipping into is Body Parts by Hermione Lee. I came to a full stop with Thomas Hardy: the Time-Torn Man by Claire Tomalin and Michael Palin’s Diaries of the Monty Python Years some time ago. I still intend to read the latter two books, but they have been pushed to the sidelines. I may go back to one of these now. Body Parts includes essays on Shelley’s Heart and Pepys’s Lobsters; Virginia Woolf’s Nose; Reading in Bed; and Jane Austen Faints. Ill go into more details in another post or two (or more). It’s good stuff. The computer room/office/little bedroom is in dire need of a good sort out, so I’m going to have to leave the more interesting topic of what book to read next until another time. I’m tempted by One Fine Day by Mollie Panter-Downes, Mister Pip by Lloyd Jones (short listed for the Booker Prize), or Ladies of Grace Adieu by Susanna Clarke. Wow, I guess the world is passing me by. I can’t imagine that Lawrence is now considered “outmoded.” I thought he was considered one of the literary world’s treasures, like Hemingway, Fitzgerald, Faulkner, Austen. I wonder when he fell out of popular favor. Yes, I was surprised Nan that Lawrence was in this category – but pleased too. I’ve had my copy of Sons and Lovers sitting on my bookshelves for far too long unread. It’s an amazing read and I really enjoyed it even though I found it quite harrowing in parts, the death of Mrs Morel in particular. I’ve been wanting to read Body Parts for a while — your description of it makes it sound SO intriguing. I tried reading Poe for the Short Story Sundays at the RIP challenge, but had a horrible time getting into them. Maybe I’ll leave them for another day. So I picked up Fragile Things by Neil Gaiman!! I was hooked by the first page! I’m looking forward to hearing what you thought of the Lawrence book. I started The Rainbow, but I have a couple obligation reads I really need to finish, so everything else is being pushed to the side at the moment. I found a used book by Mollie Panter Downes that I’d like to read as well. Like so many other books….it’ll have to wait….